Estée Lauder signed popular model Arizona Muse to be a new face for the brand. Described as one of fashion’s brightest stars, Muse will join Estée Lauder’s roster of high-profile models, which includes Elizabeth Hurley, Carolyn Murphy, Hilary Rhoda, Constance Jablonski, Liu Wen, and Joan Smalls. Muse said she’s excited to work with Tom Pecheux, as well as shoot the skin care campaigns. “I especially love skin care. It is something that is the base of everything,” she said, adding, according to WWD, “that Lauder’s Re-Nutriv is a new favorite. Muse’s rise in the fashion world has been extraordinary. Her portfolio includes striking images created by some of the industry's most influential fashion photographers, including Steven Meisel, Patrick Demarchelier, and Paolo Roversi, within 12 months of her first runway appearance. She has quickly landed high-profile fashion campaigns and worked with every influential fashion brand and magazine in the world. Muse has appeared on the covers of Korean, Australian, French, Russian, and British Vogue. During the Spring 2012 couture shows in Paris, she walked the runway for Chanel, Giorgio Armani, and Christian Dior. Among her credits, Muse counts more than 30 runway shows in New York, Paris, and Milan for Fall 2012. She has also been featured in YSL Beauté advertisements. 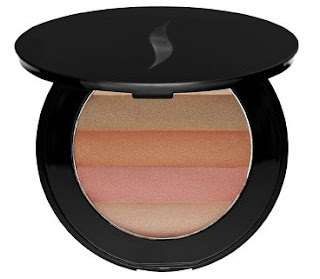 Introduced in tandem with Sephora's super-hit Sephora + PANTONE UNIVERSE Collection, but not actually part of that collection, SEPHORA COLLECTION Harmony Face Powder in Let's Dance ($24) is a multipurpose face powder in tangerine hues. Intuition told me to order it. Sometimes, my hunches turn out to be great. Sephora's photo of it looks so-so. It's really gorgeous. You can blush, get bronze, highlight, and contour with this versatile, all-in-one powder inspired by Tangerine Tango, the Pantone Color of the Year. The palette of warm hues is the perfect way to wear the season's top shades. What's more, this palette is humongous. When I opened my box from Sephora, my first thought was, "What's that black saucer doing in there?" Let's Dance is 4.5 inches in diameter - an amazing value at $24. You'll find yourself using all colors blended for a luminous glow. The stripes of color are so large, though, you can easily apply them individually to create different looks. The paraben-free, talc-free formula contains volcanic clay for a soft, comfortable wear you'll love. I've been blown away by the quality of the most recent Sephora-brand products. Since nearly anyone can get this week's V.I.B. discount, you might want to order it now. See below for details. The powder is sheer, with buildable coverage. As usual, I applied it heavily with a sponge-tipped applicator and took my photos in full sun. The top and largest swatch was composed using all the shades. I ran the applicator vertically from the top to bottom of the palette. I think I love it! It's not just "like." It's definitely shimmery (all the shades are), but shimmer doesn't scare me. The second shade down on my arm is the shade that looks brown in the compact. The third shade is a blend of the pink and peach shades directly above the brown shade in the compact. The shade at the bottom of my arm, the lightest swatch, is the light flesh peach shade at the bottom of the palette. It's very sheer, which is why you won't see much color in that swatch. Once again, I find myself urging you to check out Sephora's latest. The limited-edition Let's Dance reminds me of Bobbie Brown's Shimmer Brick for Body - in size, but not in price. Bobbi's three-stripe color scheme is different, but that's a minor detail (smile). About the V.I.B. discount for Chic Week. If you are a V.I.B. (frequent flier), you already know there's a 15% discount promotion rolling. I keep a second Sephora account, one that I seldom use. It's not a V.I.B. account. Yesterday, they offered "that account" the discount if I joined the Beauty Insider program. So, if you want the discount, and you're not a V.I.B., join the Beauty Insider program online and and use the code CHIC. Let us know if that works for you. It should. La Mer's The Reparative Body Lotion ($150) is an indulgence - a delightful, if somewhat expensive, treat for the skin and senses. During the Neiman Marcus Beauty Event, the totes that were a gift with purchase contained an empty container for a sample of the new The Reparative Body Lotion. Anyone who left the store with her tote - without realizing she had to examine the contents to see what she had to specifically request - had to have been annoyed. I had the good fortune to have a great sales associate, Loula Ayoub, who wouldn't let me leave the store without my generous sample. I really don't know why Neiman Marcus does that empty-container thing. It's intended, I'm sure, to make you stop by the counter to hear the sales pitch. I don't need the coercion; I just want the sample so that I can try the product at home and decide whether I like it. Anyhow, I love Reparative Body Lotion. It's a beautifully scented, thick body lotion that makes my skin feel nicely hydrated. It's billed as "a transformative treatment that delivers the anti-aging power of a serum to the body, renewing and smoothing on contact." The Reparative Body Lotion is a Neiman Marcus Group and La Mer exclusive." La Mer's nutrient-rich Miracle Broth, the heart of its products, as well as the "Reparative Ferment" and a unique Marine Ferment, allow The Reparative Body Lotion to visibly firm and revitalize skin. The "Reparative Ferment" is a powerful healing agent of clarifying algae, marine peptides, and Rock Samphire. The clarifying algae helps brighten the skin, even tone, and diminish the look of age spots. Marine peptides help repair the look of lines and wrinkles. Rock Samphire, a seashore plant known for its exfoliating benefits, offers exceptional smoothness. Meanwhile, the Marine Ferment works to create a protective shield for the skin, preventing dehydration and sealing in moisture. Does it work? I think so. It's pricey - pretty steep for a body lotion, no matter how luxurious and large in size. Since it's related to Crème de la Mer, I moisturizer I will never be without, I think I'll enjoy The Reparative Body Lotion, especially for summer use. I can find it at Neiman Marcus. You can too. Did you get your sample? What did you think? Now I want to try La Mer's new Blanc del la Mer The Brightening Essence Intense and The Brightening Infusion Intense. This has been the best year ever for hellobores in my garden. The clumps of nodding flowers brighten my garden when nothing else is blooming. From the white flowers shown above (you can't see their beautiful green speckled centers) to the darkest of reds below, the blossoms have been glorious. I had to lie on the ground to get the photo of the dark red flowers. Even though they look a bit bedraggled, they were fine - just protecting themselves on a cold day. May I call the weather schizophrenic? Psychotic? We went from 80-degree days to a frost in one day. While we haven't had severe weather, other parts of the country are having unusual spring snow storms. Our cold night killed off the last of my star magnolia blossoms. Littering the ground, like spilled popcorn, they're still a reminder of the stunning 10 days they gave me. I received a few fragrance deliveries this week. Right before Sephora's V.I.B. event (not my smartest move to pay full price, but they are currently sold out), I ordered two of the new Flora by Gucci Garden fragrances: Tuberose and Magnolia. I've only opened one of them; I like to space out the fun. I'm bummed to report that Tuberose doesn't smell like tuberose. It's a pretty white floral blend, just not characteristic of the sultry tuberose, with its distinctive scent. The notes are listed as violet leaves (Do they have a fragrance? I'll have to go outside today to see), peach, tuberose, orange flower, rose, cistus, and white cedarwood. The tuberose is hiding. I also received two new Keiko Mecheri Bespoke fragrances from MiN New York: Canyon Dreams and Tangeri. I had previously tried them after MiN sent me samples of the full Bespoke Collection. Canyon Dreams and Tangeri were my favorites of the seven new scents, but I could easily have ordered two more. It's a beautiful collection. You can check it out on MiN's Web site. Are you interested in fragrance? I wonder at times. This week, many readers commented on my makeup features, but no one commented on the CREED post. CREED's Acqua Fiorentina Pefumed Oil will beautify your life - just in a different way than the latest lipstick does. I want to keep writing fragrance features. I hope someone reads them. I'll be headed over to Neiman Marcus at Mazza Gallerie today, hoping they received the rest of Le Métier de Beauté's Cherry Blossom Collection. We've been waiting for the glosses and brown liquid liner. I'm ready for a color treat as the trees show their leaves and the azaleas start to bloom. I have two giveaways underway this week. Both end tomorrow, March 31, at midnight. Make sure to enter after you buy your Mega Millions tickets. I've got mine, and I'm dreaming winning over a half-billion dollars. You could win Sephora's acclaimed Sephora + PANTONE UNIVERSE Color of the Year Lip Gloss set here, or John Masters Organics Bearberry Oily Skin Balancing Face Serum here. Don't leave your entries on the Friday Forum, please. Just comment on the giveaway feature that interests you. Good luck! Update: The Bergdorf Goodman Gift Card Event starts soon (April 18-22). You can pre-order now. Spend $500 and get $75 off. Spend $1000 and get $200 off. Call Jason Beers (Guerlain) for all your fragrance and beauty needs. He will be able to help you with Guerlain's summer collection (check out The Non-Blonde and Temptalia), which you won't want to miss. Jason can be reached at (212) 872-2734. 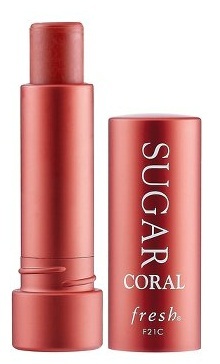 Fresh Tinted Lip Treatment SPF 15 in Sugar Coral ($22.50) is the latest shade in a series of super-hits from Fresh. Currently exclusive to Sephora, the tropical Sugar Coral was described by Alina Roytberg, Fresh Co-Founder. This was inspired by a trip to a remote island in the Bahamas: the fresh morning breeze, alfresco lunches of exotic fruit, and snorkeling with bright fish around the reddish-orange coral reef. Sun, sea, and the spirit of vacation: that's Sugar Coral. Fresh's Tinted Lip Treatments moisturize, protect, and smooth the lips while adding a sheer tint of color. I've bought every shade ever introduced - some in multiples. I always have one within reach. No wonder they are so moisturizing. In-vivo testing has shown that Tinted Lip Treatment will keep your lips hydrated for up to six hours after application. Treat your lips to a juicy coral color with this tint that provides sheer coverage or buildable color. Sugar, a natural humectant, ensures long-lasting moisture, while meadowfoam hydrates and the oil of black currant seeds conditions the lips. It is further enriched with antioxidant-rich vitamins to defend against wrinkle-causing free radicals and provides year-round protection from damaging UV rays. If you've used this tinted balm, you know how nice it is. Let's look at the color of Sugar Coral. Isn't it gorgeous? Not too orange, not too pink, Sugar Coral is the "shade of the moment," a sheer dark peach in a coral case. It's warm, sunny, and energizing. You know that your finger pad is the best place to test lip products (and keep your lips germ-free)? It's closer in color to your lip color than your arm. While my finger may look very pale in the photo above, it is darker than my arm - trust me. Isn't Sugar Coral luscious? I may live in it this summer, especially when I know I'll be outdoors. I love sheer colors that are good for me. Want one? You'll find it at Sephora, where there's an in-store V.I.B. preview event (with a 15% discount) today (featuring special goodies). The discount for V.I.B.s continues until April 6. Remember to look for Sugar Coral if you go. Jason Wu, internationally renowned fashion designer and favorite of Michelle Obama, and Laura Slatkin, founder and CEO of NEST Fragrances, one of my very favorite luxury home fragrance manufacturers, have launched Jason Wu’s first fragrance, Orchid Rain, in a scented candle that combines style with a divine fragrance. I was burning it as I wrote this feature yesterday, and I was intoxicated by the fruity-floral fragrance that filled my room and spilled into the next. Decorated with an understated floral print inspired by Wu’s Spring 2012 fashion collection, Orchid Rain features a unique, exotic combination of notes. The new Jason Wu Orchid Rain Candle debuted this week. fragrances for some of the biggest names in the business (including the CEW Award-winning Elton John Black Candle). The sophisticated, custom-made porcelain candle vessel features Wu’s signature grey, black, and white floral petal print with a light bisque finish. In colors that will fit into any color scheme, the candle is topped with an elegant, gold-plated lid. The classy lid protects if from dust, cat and dog fur, and any debris that might be floating around the house when the candle's not in use. 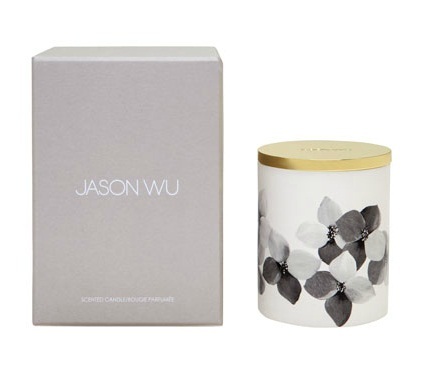 Packaged in one of Jason Wu’s classic soft grey, ready-to-gift textured linen paper boxes - beyond elegant - the Jason Wu Orchid Rain Candle by NEST Fragrances is available in a seven-ounce candle for $48. You can find it at Neiman Marcus (where shipping is currently free with code FSMAR), Bergdorf Goodman, and select luxury boutiques nationwide. It would make a nice gift - if you could part with it. I would find that very hard to do. Mine was a gift from NEST. Jason Wu launched his Ready-to-Wear Collection in the spring of 2006. Fast forward to today. Only six years later, he has emerged as one of the leading global talents based in New York. He is committed to making beautifully crafted clothes, and the idea of creating a collection that merges American sportswear with old-world glamour. Influenced by the classic photography of Richard Avedon and the works of Charles James and Jacques Fath, his collections aim to revitalize the art and perfection of dressing with a relaxed and youthful attitude. He is committed to maintaining strict quality standards and produces over 80% of his collections in New York's Garment District, which is also the home to his design studio and showroom. You cannot have escaped the news that Wu is one of the First Lady's favorite designers. I'll have more to tell you about Laura Statkin soon. I hope to interview her next week. Originally introduced for Fall 2010, Chanel's Pink Explosion Joues Contraste Powder Blush ($43, Joues Contraste Fards à Joues Poudre in French) is back. This time, it's available in the powder formulation that's common for Chanel's blush launches in the United States. The 2010 formula was baked. I bought (and featured) the original Pink Explosion. It had reached out from the display and said, "Don't leave here without me!" I felt the same way about the new one. I had to have it when I saw it was available at Chanel.com. Pink Explosion is a bright, cool pink. I applied it very heavily to show you the shade, and I took my photos in full sun. I used a sponge-tipped applicator to apply the stripe at the top of my arm. I used a dense blush brush fairly heavily to apply the swatch below. 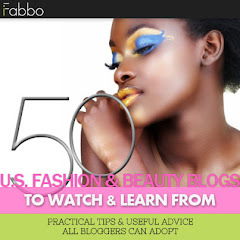 You can see how bright the color can be if you over-apply it or fail to blend it. Applied normally, it's beautiful. It definitely adds a pop of color to my face. Pink Explosion is a more vibrant pink than Tumulte, one of the other Chanel blushes I ordered this week. While they are both cool pinks, Pink Explosion is deeper. It's also more sparkly - and powdery in my opinion. I wish I could show you a comparison photo with my original Pink Explosion. It is packed away, the fate of much of the makeup I was wearing before my December 2010 surgery. I did a quick scan, but it didn't jump out at me from the many boxes I packed for storage. I wouldn't suggest you buy another one, like I did, just because you couldn't locate the 2010 version, but if you are in the mood for a new, bright pink Chanel blush, Pink Explosion could be calling your name. I purchased all of my new Chanel Joues Contraste Powder Blushes at Chanel's Web site. They are also available online at Nordstrom. I haven't been to a store in days, but I suspect they are arriving at all of the Chanel counters. I'm headed over to Neiman Marcus for a fashion and cocktail party tomorrow evening. I'll check then to see if the new blushes have arrived at the counter. 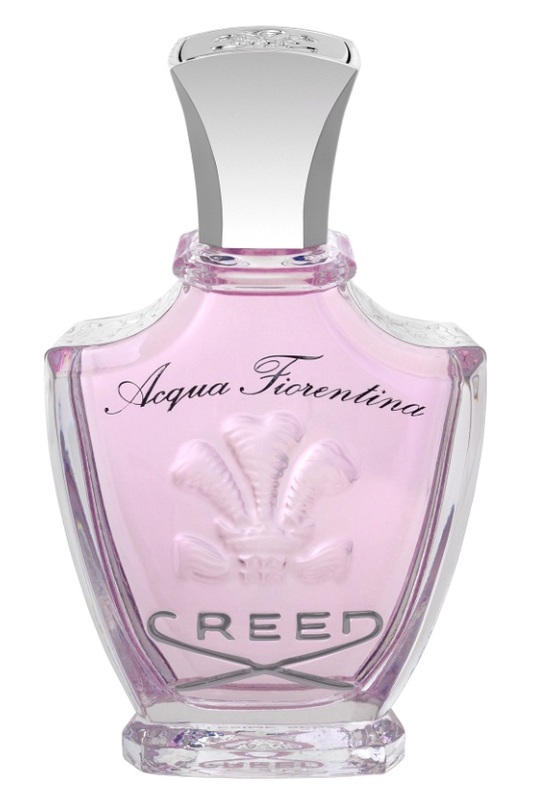 I adore CREED Acqua Fiorentina Eau de Parfum ($240), a fruity floral fragrance that was introduced in 2009-2010 (shown below). Master perfumer Olivier Creed, with his son Erwin, created a "statement about the lasting value of fine scent, shared and enjoyed from generation to generation." The inspiration for Acqua Fiorentina was 15th century Florence, where artists and innovators, such as Leonardo da Vinci and Michelangelo, sparked a new flame of beauty and culture with Renaissance art that's priceless today. Fittingly, orchards and farms around Florence are the sources for the ingredients in Acqua Fiorentina. 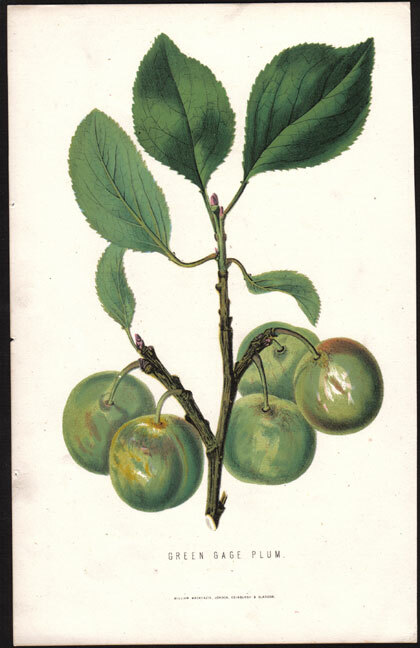 The top notes are lightly sweet greengate plum (often used in cuisine as a dessert plum) and bergamot orange. The middle notes include Renaissance roses, pink carnations, and Calabrian lemons, a finely rendered portrait of fruits and blooms that belongs on a canvass. The base notes are Virginia cedar and Indian sandalwood, two of my favorites. They give Acqua Fiorentina a soft dry-down that's easy on the nose. 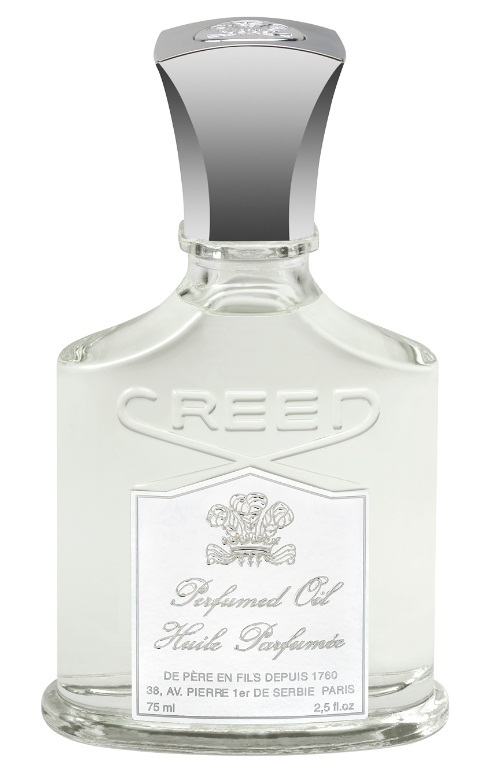 That brings me to Acqua Fiorentina Perfumed Oil ($145), which I purchased recently from the CREED Boutique in New York. The day it arrived, I sprayed it on my neck, chest, and arms before bed. I awoke the next morning and wondered for nearly 30 minutes why my whole bedroom smelled so good. Having forgotten my treat before bed, I was worried that a bottle of perfume has spilled. Crazy me! I was the reason my bedroom had that heavenly fragrance. Actually, CREED can take most of the credit. I just had the good sense to buy and use the Acqua Fiorentina Perfumed Oil. To make perfumed oils, Olivier Creed uses the same crop of handpicked ingredients he uses to make his original fragrance formulations (and he's very picky about his ingredients). Instead of the traditional fine fragrance alcohol base, he crafts an alternative of calendula oil to gently soothe the skin, almond oil with omega-3 for its treatment benefits, and aloe extract to soften and heal the skin. The result is fine, fragrant oil that's light enough to spray on its own or to layer with its companion eau de parfum. Interestingly, CREED's first perfumed oils were made for Napoleon III and Empress Eugénie, who used the oil to soothe her skin during the long Paris winters and scorching summers - basically any time she wanted a treat. I'll be using my new Acqua Fiorentina any time I feel like it too, but especially before bed. I love drifting off to sleep with a divine dry oil scenting my skin while it moisturizes. I really love awakening to the same divine fragrance the next morning. The Acqua Fiorentina Eau de Parfum is in extremely short supply. It's my understanding that when Creed cannot source his ingredients, he will discontinue production until he can replace the ingredients with exact duplicates. I'm not sure where you might find a bottle of the irresistible eau de parfum today. I want the flacon, and I'll start my quest now. I bought the 2.5-ounce spray at Neiman Marcus months ago. I do know where you can find the Acqua Fiorentina Perfumed Oil: at the CREED Boutique, where I bought mine. You should also be able to find it at Bergdorf Goodman, Neiman Marcus, and select Saks Fifth Avenue stores, although it's so nice, they sell through the stock quickly upon delivery. When my shampoo and conditioner order arrived from Beautorium last week, I found a full-sized gift with purchase in my box. Unfortunately, for me, an oily skin treatment is useless. Fortunately, after reading your comments on yesterday's NARS tinted moisturizer feature, I'll bet I have a few readers who could use John Masters Organics Bearberry Oily Skin Balancing Face Serum ($20). Thus, a new giveaway is born. I have never used it, but I love every John Masters product I have ever used - and continue to use. Billed as a targeted toning mist, it "acts as an ultra-astringent to balance pH, tighten pores, and leave skin glowing and refreshed." Green tea leaf extract infuses skin with antioxidants, while bearberry extract helps to reduce sebum production. You can read the other ingredients if you click on the link above. Let's do a quick contest, which will end on Saturday - the same time my other weekly contest ends. How can you enter to win this contest (technically a sweepstakes)? Just leave a comment on this feature (not in another BTiB post). After you comment here, feel free to send me an e-mail at bestthingsinbeautycontests@gmail.com (the contest address, not my "personal" e-mail) and identify your comment. You can never be too careful about sharing an e-mail address you care about on a blog, so feel free to follow this step (an alternative is to code your e-mail, e.g., myname at gmail dot com, in your comment). Please make sure I have your e-mail. If I can't notify you, you can't win - even if your number is drawn. You can earn a third entry by tweeting this contest. You must include "@BTiBeauty" (without the quotes) and the contest title in your tweet. Remember, tweet the contest title - if you don't, that entry won't count. I will tweet the contest soon, and you can simply retweet it to earn that second entry - if that's easier. The deadline for entries will be Saturday, March 24, at midnight. The next morning, I will use a random number generator (random.org) to select the winner. I will e-mail the winner on Sunday morning. The winner will have 48 hours to reply to my message and provide a shipping address. After 48 hours, the prize will be forfeited, and another winner will be selected. Make sure to check your e-mail - and look in your spam folder - when the contest ends. I decided I would try the new NARS tinted moisturizer before it even hit the stores. Its reputation had preceded it. Every review I read - before and after its launch - was laudatory. Bloggers loved it. So did their readers. I'll skip to the bottom line. My reaction is mixed. 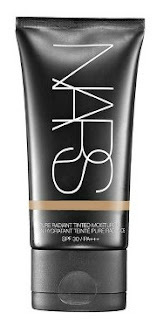 I purchased NARS Pure Radiant Tinted Moisturizer SPF 30/PA+++ ($42) from Sephora. The only question in my mind was whether the lightest of nine shades, Finland, would match my skin. 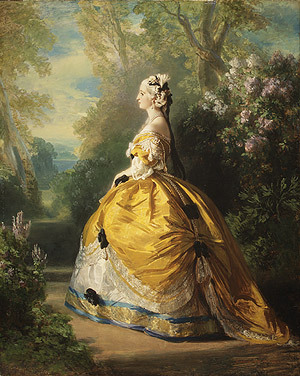 It's described as light, with a neutral balance of pink and yellow undertones. That sounded absolutely perfect for me, and I was too lazy to zoom up to Nordstrom to test the shade. It might be more difficult for someone whose skin color is in the middle tones. Those little square color representations look very similar, but the descriptions are surprisingly accurate. The good news is that Finland is, indeed, perfect in tone for my skin color. While it looks a tad yellow as I start to apply it, the shade is perfect when blended. It evens my skin, takes out the central redness, and has enough pigment to blur the imperfections on my face. Tinted moisturizers have two (three, actually, if you count SPF) major features that contribute to my impression as I consider them: color/coverage and hydration. NARS passed the test on color and coverage (with a slight exception described below). The bad news is that this NARS Pure Radiant Tinted Moisturizer isn't much of a moisturizer for my dry skin. The first time I used it, I struggled to blend it, even though I had applied Armani Crema Nera serum a half-hour before. It felt chalky and dry, and that's how it looked. The next time, I applied an extremely emollient moisturizer under it and that worked pretty well. Why, though, would anyone wear a tinted moisturizer that requires a base of another moisturizer? It defeats the purpose. I was caught off guard by the hydration failure. I should have read the marketing description, which follows. Infused with lush, naturally derived ingredients, this lightweight tinted moisturizer immediately helps thirsty skin feel hydrated. It has been proven to help reduce the appearance of discoloration and dark spots caused by hyperpigmentation for a clearer and brighter complexion in just four weeks. Oil-free and luxurious, it obscures the appearance of lines, wrinkles, pores, and other imperfections. SPF 30/ PA+++ adds a translucent veil of protection. Natural polysaccharides from Moorea island in French Polynesia hydrate, condition, and help encourage natural cell renewal. Mineral-rich seawater uniquely revitalizes and adds key minerals back into the skin. Pure Radiant Tinted Moisturizer SPF 30/PA+++ helps improve the skin's overall condition. Soft and smooth to the touch, skin looks natural and glowing. This dermatologist-tested product is free of oil and synthetic fragrances and is non-comedogenic. There's my tip-off, in both paragraphs. This tinted moisturizer is oil-free, which means it's suitable for those with oily skin, will probably work just fine for those with combination skin, but doesn't provide enough moisture for dry skin. Normally, oil-free products are not the best for me - or anyone whose skin is dry to very dry and blemish-free. According to NARS, 84% of women who tried it felt their skin was more radiant and luminous. I found that surprising. It leaves a very matte finish on my skin, and I see nothing that could be described as radiance when I'm wearing it. Whether or not I've prepped my face before I apply Pure Radiant Tinted Moisturizer, I don't like the coverage on my nose, which, on close examination, is uneven because the pigment sinks into the pores. It also requires careful blending around my under-eye area, where it settles into fine lines. I have no doubt that there's a huge market for NARS Pure Radiant Tinted Moisturizer SPF 30/PA+++. It offers UVA and UVB protection (albeit at a relatively low level of SPF 30); it's available in many shades, an acknowledgement of the realities of our varied skin tones; and it's readily available at Sephora, NARS counters, and online at NARS. Women with dry skin might want to look elsewhere. I'll be featuring a few other tinted moisturizers in the next few weeks that are better choices for dry types. Yesterday, when my three new Chanel Joues Contraste Powder Blushes ($43, Joues Contraste Fards à Joues Poudre in French) arrived, despite the late hour, I was able to snap some photos of Tumulte (#70). A new shade for Summer 2012, Tumulte is a pure, cool pink, one that provides a whisp of color perfect for wear now. Chanel's unique powder blusher, a favorite for many of us, offers buildable coverage, from natural to dramatic, and imparts a flattering radiance to the cheeks. The remarkably silky texture ensures easy application and blending. Applied high on the cheekbone, or near the eyes, it instantly lifts and softens the face for a youthful look. Tumulte couldn't be more perfect for that highlighting lift. I can't tell you the shade of Tumulte is unique. It's a gorgeous pink - one you should consider if you need a new pink blush. If you are a Chanel addict, then, of course, you will need it. I did, even though a thorough search would turn up any number of lookalikes at my house. Why look? I wanted it. For my swatch photos, I applied Tumulte heavily with a sponge-tipped applicator at the top of my arm, and I applied it fairly heavily with a dense blush brush below. Tumulte is very light and sheer when applied properly, so I knew it would take a heavy application to show you the shade in swatch photos. Just to prove that Tumulte's not the shade of my dreams - the subject of Please Make This Blush! - I took a photo in front of the redbud tree. Tumulte is a cool pink, but it doesn't have the lavender that make the blossoms unique. Tumulte's pink is pure, without a trace of lavender, peach, or brown. If you compare these swatch photos to the other new Chanel Malice (scroll down), you'll see that the colors are entirely different. Malice is warm. Tumulte is cool. Both are, in my opinion, lust-worthy. They offer a welcome gleam, not a sparkle, to my cheeks. The formula is fabulous. You can swirl the brush around on the color without flying powder - no mess in the compact and no potential fall-out on your cheeks. I can build the color easily, without any cakey effect on my cheeks. It's a 100% win. I purchased all of my new Chanel Joues Contraste Powder Blushes at Chanel's Web site. They are also available online at Nordstrom. I haven't been to a store in days, but I suspect they are arriving at all the Chanel counters. Perhaps I should go shopping! My three new Chanel Joues Contraste Powder Blushes ($43, Joues Contraste Fards à Joues Poudre in French) arrived today - finally - and I had time to grab swatch photos of one this afternoon. I selected Malice (#71), the shade that had given me pause before I ordered it, sight unseeen. On Chanel's Web site, Malice looks orange in the teeny tiny color representation. Malice isn't even close to orange! I can see its coral hues in the compact indoors in dim light. Outside? It a vibrant warm pink with just a touch of peach. Malice carries just enough micro-sparkle to give it a gleam without making it appear artificial or unnatural. There's a reason you wont see fine glitter in my swatch photos. The ultra-fine powder in the blush blends color and soft sparkles with a result that gleams without glitter. Malice is a new shade, and the timing of its introduction could not be more perfect. It's a great shade to wear now, as the weather warms, and throughout the summer. I think the color of this blush is lust-worthy. I could called it scrumptious, luscious, stunningly beautiful, or any number of superlatives. I'm so glad I took a chance, ordering it on faith. I had seen blog photos of it, but they were all different, leading me to wonder what Malice would look like on my own skin. I swatched Malice heavily with a sponge-tipped applicator at the top of my arm, and I applied it moderately heavily with a dense blush brush below. My swatch photos were taken in full, afternoon sun. Malice gleams. I'm reminded of a watermelon, a luscious fruit with an inviting, juicy rose-pink color. Even though I have a lot of makeup, it's conceivable that I could run out of Malice. I wonder if my hoarding instincts will kick in this week. I suspect that your skin tone may affect the way Malice appears on your own skin. On mine, it's pink. Those with darker or olive-toned skin may bring out its peach tones. If you purchase it, please let us know how the color translates on your skin. 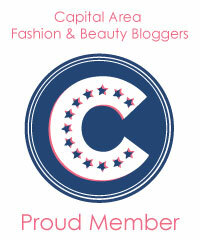 I purchased all of my new Chanel Joues Contraste Powder Blushes at Chanel's Web site. I'll show you the others as soon as I can get photos. NARS Duo Eyeshadow in Paramaribo ($34) for spring has earned its keep at my house - despite the fact that it doesn't look anything like what I expected. It's described as a metallic brass/metallic bronze duo, which is correct. It was the NARS photo, shown above, that threw me off. It looks like two green-toned shades, right? I wondered when the duo arrived it I had received the right product. The NARS photo at this link is more accurate, which reassured me. My photo above was taken in full sun. It shows the two gorgeous shades in Paramaribo as my eye sees them. I had ordered Paramaribo the second it appeared on the NARS Web site - the same time I ordered Lhasa. I'm not sure why it took me so long to feature this pretty eye shadow duo here. Apparently, other things distracted me. Lhasa sure did; I adore it. Fast forward to this weekend, when I reached for Paramaribo to wear it, and it occurred to me that I had never posted it. I swatched the duo shades heavily with a sponge-tipped applicator and took my photos in full sun. The shade on the left in the compact is shown at the top of my arm. It's a metallic antique brass that has, depending on the light, an ever-so-slight khaki hue in it. The beautiful metallic brown, a bit toned down in shimmering impact from the other shade, is a gorgeous, pure brown that will flatter all skin tones. These shadows are finely milled and have a beautiful texture and finish. Unlike some NARS eye shadow misses during the last few years, Paramaribo adheres to the skin perfectly, leaving exactly the level of coverage you wish to apply. I found that I can apply both shades with a very light hand for a gleaming wash of color, or use them more heavily for a splash of bold neutral color. 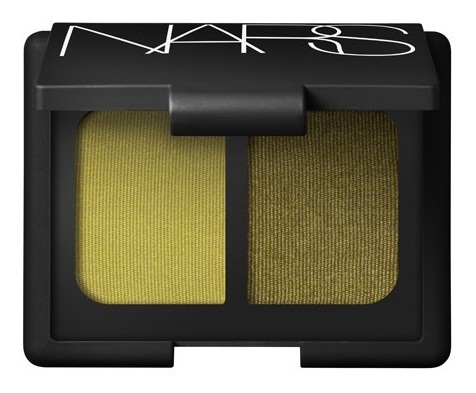 The only thing potentially missing is the green shown in the NARS promotional photo. I don't miss it! If you haven't already given Paramaribo a look-see, check it out. It's available everywhere NARS can be found: at the NARS Web site, select Neiman Marcus and Nordstrom stores, Sephora, and other sources. I love it and think you will too. The shades are seasonless. You won't feel constrained to wear it only during the spring. Please make a blush the color of this redbud tree's blossoms - a pink with a touch of lavender. I'd prefer a cream with gleam and glow, not serious shimmer. It should blend effortlessly and stay put all day. I don't think I have a cream blush this color, and I'd really love to add one to my collection. Le Métier de Beauté's beautiful Mystique is pretty close in color, but a bit too light for what I envision. If it could do double duty, like Le Métier de Beauté's Crème Fresh Tints for Lips and Cheeks or Bobbi Brown's Pot Rouge, that would be fabulous. A liquid would be fun too - something like BY TERRY's Rose de Rose Sheer Liquid Blush or Guerlain's Terracotta Blush Sun Shimmer Highlighter. Just not too shimmery, please. Something like Giorgio Armani Beauty's Liquid Sheer would also be fun - not a blush exactly, but a gorgeous face highlighter. If we can't do a cream or liquid, a powder blush will be OK, as long as it has a creamy texture and no powdery fall-out. It has to last all day too. No color fade, please. P.S. I'm hoping my readers can point me to just the right shade to save you the trouble of development. Maybe they can also add some ideas for features. Just as I thought I had finished drooling over the Sephora + PANTONE UNIVERSE Color of the Year Collection, I opened the Color of the Year Blush Duo ($26). The duo's elegant packaging, with all the features of the other items I had purchased, offered a surprise. The lightly frosted Plexiglas-like top of the palette has magnets in all four corners. It can be removed entirely, and when you are ready to return it to protect the blush, it snaps right into place. The eye shadow quad in the collection has the same design. I think it's beyond cool. This luxurious blush duo, inspired by Tangerine Tango, the Pantone trend-setting color of the year, offers micro-fine pressed powders that deliver all-day wear. Each shade can be worn alone or layered for a contoured look and a unique shade and finish. Light, yet creamy to the touch, with no fall-out, this translucent powder is packed with brown seaweed extract to keep your skin soft and supple. "Smooth away fine lines and blemishes with a veil of natural coverage and give your cheeks a warm, energized flush." I think my camera focused on the blinding white packaging, rather than the blushes in the photo directly above. In both product shots, mine and Sephora's, you can see that one shade is unadorned by pattern, while the other is fancy, with the circular, bulls-eye pattern that grace the Prisma Chrome Blush in the collection. My photo shows the positioning of the items the way they arrived. Desert Flower is on the left, and Coral is on the right. Desert Flower, Pantone #15-1435, is a light, matte tangerine-peach shade. Coral, Pantone #16-1539 is a pink-toned orange with gold shimmer. While it looks like a sparkling rose in my swatch photos, it does show its peach in person. It's really a gorgeous shade - even on my cool-toned skin. Desert Flower is shown at the top of my arm, and Coral Flower is shown below. I applied both heavily with a sponge-tipped applicator and took my photos in full sun. I think both shades are stunning. Although matte, Desert Flower shows me some life, as you can see in my photos. It reflects light, while adding a flush of spring peach to the cheeks. Coral Flower shimmers indoors or out, with a brilliant sunset shade that looks pink one moment and peach the next. I can't explain its changing character on my skin. Magic? It wouldn't surprise me. This whole collection is magical, and a pleasant surprise. I'm thrilled. I'm wearing Coral on my arm indoors as I write, and I see shimmering peach. My office is a bit dark because of our cloud cover. When I go outside in sunlight, the pink tones are more prominent. I suspect other environmental conditions will affect the shade on the skin. Clothing may have an effect, along with your own skin chemistry. No matter what the color, I'm very pleased with the chameleon. I think Sephora hit a home run with this collection. Here's their description of the Pantone partnership. United by a passion for color, Sephora and Pantone combined their expertise to become beauty's leading authority on color. Sharing an affection for how color can transform a face, mood, or even an attitude, this breakthrough beauty partnership will change how you wear, feel and think about color. You'll be introduced to playful shades that will inspire experimentation and exhilarating new products you'll impulsively want to sweep on. It will reawaken and reinvigorate your own passion for color or ignite a newfound love. Join us in celebrating Color of the Year: Tangerine Tango! Sephora (and Pantone) placed the bar extremely high with this limited-edition, exclusive collection. How will they top it? I showed you Sephora's new, limited-edition Sephora + PANONE UNIVERSE Lip Gloss Set ($20) yesterday. If you aren't sure about tangerine, here's a no-risk offer to take you into spring and summer. I'm going to give one away! If you didn't catch the swatches that show the variety of colors and finishes, just scroll down or click here. How can you enter to win this contest (technically a sweepstakes)? Just leave a comment on this feature (not in another BTiB post). We'll do something a little bit different. Tell us, please, what do you think of the color of the year? Are you comfortable wearing orange tones? Are you trying to overcome your resistance, as I did? Your answer won't affect your chance to win, but it will tell us how many orange phobes are out there. After you comment here, feel free to send me an e-mail at bestthingsinbeautycontests@gmail.com (the contest address, not my "personal" e-mail) and identify your comment. You can never be too careful about sharing an e-mail address you care about on a blog, so feel free to follow this step (an alternative is to code your e-mail, e.g., myname at gmail dot com, in your comment). Please make sure I have your e-mail. If I can't notify you, you can't win - even if your number is drawn. The deadline for entries will be Saturday, March 31, at midnight. The next morning, I will use a random number generator (random.org) to select the winner. I will e-mail the winner on Sunday morning. The winner will have 48 hours to reply to my message and provide a shipping address. After 48 hours, the prize will be forfeited, and another winner will be selected. Make sure to check your e-mail - and look in your spam folder - when the contest ends. Designed by Richard Blanch of Le Métier de Beauté, this Runway to Win ($40) set of three nail lacquers comes in a collectable make-up bag. Each piece is 4.0 ml. Red-y To Win Red is a delightfully deep red, a bold pop of color that makes a statement. Victory White is a soft, clean white, perfectly polished for everyday wear. Bo Blue is a shimmering sapphire blue, a fun take on the classic navy. 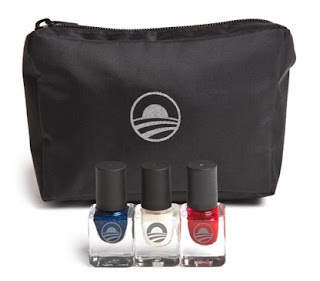 According to Politico, the set cost around $10,000 for the Obama campaign to develop in collaboration with nail guru Richard Blanch of Le Métier de Beauté. The set was created as swag for Anna Wintour’s Runway to Win campaign event in February. Now the campaign is selling the sets. The set was made in the USA. It's available at Store.BarakObama.com, where you can purchase all kinds of designer merchandise that supports the president in his 2012 campaign. I think I may have to order it. When my limited-edition Sephora + PANTONE UNIVERSE Color of the Year Lip Gloss Set ($20) arrived, I drew in my breath and vowed to change my attitude toward orange. Orange and I have had a difficult relationship since I had an orange shag carpet in my apartment during graduate school. You can imagine. Live with all that bright orange for a few years, including coordinating draperies, and you might revert to the quiet of soft greys and pastels that characterize my home today. Tangerine Tango is the color of the season - if not the year - and I need to get hip to the trends. 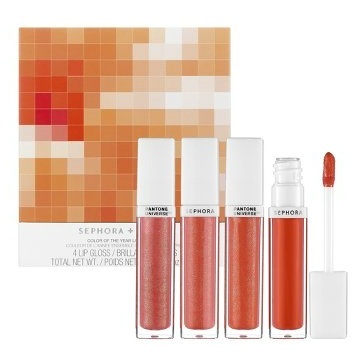 Sephora is making it easy for me with its mouthwatering new collection. This colors of the glosses in this set are scrumptious. I've already gushed over the packaging of all of the items in the new collection. I think the elegant, classy, and expensive packaging had to cost more to manufacture than the makeup, and the makeup will hold its own against like items costing many times as much. Did I mention the easy-to-remove round, clear plastic seals on both sides of the boxes? Easy to remove, they ensure you that your precious new makeup has been untouched by grimy, inquisitive hands. After I removed the seals from the lip gloss set, I pulled up box cover, beautifully designed with the multicolored orange pattern, and saw the glosses. Wow! They appeared to be vibrant variations of Tangerine Tango, and once I used them, I realized that they offered four different finishes. Had I read the marketing speak below, I might have known that beforehand. I was too impressed with the photos to actually read. Get a new dimension of gloss with this lacquered lip color that promises infinite depths of crystal reflections. The moisturizing formula will leave lips looking and feeling perfect, while the hypnotic shine creates a constant play on light. The set includes four spirited hues inspired by the Color of the Year, Tangerine Tango, in four must-have finishes. Hydrating and long-wearing, these energized glosses sculpt the lips so they appear perfectly shaped, plumped, and pretty. I was graced with brilliant sunshine yesterday, had taken the day off, and was able to get swatch photos. I swatched the colors on my arm in the same order listed above, top to bottom. Tangerine Tango Luminous at the top of my arm is a shimmering, very bright orange. It is semi-transparent, making it extremely wearable for us orange phobes. Like a ripe apricot, it makes my mouth water. The next shade is a little more difficult for orange phobes. Tangerine Tango Vivid certainly is - vivid, opaque, and in your face. I'm wearing it now, and I'm not sure I could leave the house in it. I have to work up some bravery - something that shouldn't cause you you brunette beauties to fret. I think the only way I could wear Vivid is as a stain. Apply, blot, and follow by a kinder-to-fair-blondes, gentler gloss, maybe with something pink or gold in it. Even when blotted, it's vibrant. I can't tell you it doesn't look good on me when applied straight up. It's just so far out of my comfort zone, I'd feel conspicuous leaving home in it. "Is everyone staring at me, wondering if that little aging blonde is fashion victim or an Angelina Jolie wannabe?" I've become such an accomplished online beauty shopper, I knew Tangerine Tango Glaze would be my favorite shade of the four, and it is. Sheer, peach, and shimmering, the color and finish are gorgeous. I'm sorry my swatch looks uneven on my arm. It applies beautifully on the lips. I thought I had a fairly even swatch, but my camera says otherwise. Sephora needs to make Glaze part of its permanent collection. It's an everywoman color, and it's a way for orange phobes to ease into the color of the year. Tangerine Tango Opal was an extremely pleasant surprise. The color of a ripe peach, it straddles the line between opaque and transparent, and the color absolutely gleams on the lips. Had I had Opal years ago, I might be more friendly to orange today. By now you've figured out that the names embody a description of the finishes. It's also a nice feature that those over 40 can actually read the names on the bottom of the tubes (unlike some of my favorite, unnamed, European brands with teeny tiny print). Sephora took care of every detail when it created this collection. Where are you going to find a stunning gloss set for $20 - a set that impressed a jaded luxury makeup buyer? Sephora! I'm not sure how Sephora is going to top the Sephora + PANTONE UNIVERSE Collection. They've set an amazingly high bar. If anyone from Sephora is reading this feature, congratulations! The collection is a home run. Next up, I'll show you the collection's Blush Duo, another don't miss item, and it has another luxury touch in the packaging I couldn't believe. The colors in the duo offer more pink, so those who prefer pink will find colors to love. As you know, this collection is available only at Sephora, and I am dead-sure it will sell out. I knew it would be beautiful, and it is. I am so impressed by everything about the limited-edition Sephora + PANTONE UNIVERSE Prisma Chrome Blush in Apricot Brandy ($16). 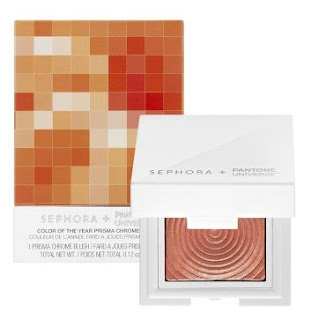 In the tangerine theme, the color of the year, Sephora has created a blush that combines all the best features of baked, powder, and cream formulas, releasing perfect color and a texture that lays on the cheeks like a second skin. Easily blendable and buildable without being powdery, this unique blush leaves an unbelievably polished and sparkling finish. The warm shade, Apricot Brandy (PANTONE #17-1540), was inspired by the Color of the Year, Tangerine Tango, and will light up the apples of your cheeks with a spirited glow - or provide highlights in tangerine that are sure to warm your face. I cannot say enough about the elegant packaging of the Sephora + PANTONE UNIVERSE Collection. It's substantial, better than the packaging of products that cost ten times as much. The box is gorgeous (see photo above); the box insert is equally stunning in its craftsmanship. The blush compact looks pricey (it's a bit small, but hey?). All in all, this blush is as worth of your consideration as any I've seen this year. I don't usually dwell on packaging, but take a look at what you'll see after your lift up the outer packaging. The blush compact is nestled within a perfectly fit insert, with a clear plastic covering to protect it. All of this wouldn't matter if the blush were mediocre, but the sparkling peach color is dynamite. It's got style. I was impressed when I opened the compact, and I was even more impressed when I started to play with Apricot Brandy. I took my swatch photos in full, morning sun, and I swatched heavily with a sponge-tipped applicator. Have you seen a peach this luscious recently? Can you believe that Apricot Brandy is a house brand, costing only $16? I even wonder if Sephora has recently changed manufacturing partners, moving from ho-hum to exciting. The photo above portrays exactly how Apricot Brandy looks on my skin. The photo below is shows more saturated color, but it's the same swatch, with different lighting conditions. The color applies beautifully and sheerly on the cheeks, with buildable coverage, and a finish that's creamy - without any fall out. This was one of the best sixteen dollars I've spent recently. I'm smitten. If Apricot Brandy is too sparkly for you to consider as a blush, you can apply it sheerly as a highlighter. Definitely check it out and see if you can resist. I can't wait to show you the other beauties I purchased from the Sephora + PANTONE UNIVERSE Collection. All of them left me gasping. They are simply amazing - and available only at Sephora. Finally, the last two of my new Giorgio Armani Beauty Rouge d'Armani Sheer Lipsticks ($30) - tried and photographed. Rouge 401 (Ripe) is shown the left, and Pink 501 (Vita) is shown at right. Both have already become reach-for shades. I think they're exquisite. My swatch photos were taken in full sun, but in totally different light intensities. Rouge 401 is shown at the top of my arm, with pink 501 below. On my lips, Rouge 401 looks rose, not red, which suits me just fine. Pink 501 is a scrumptious watermelon pink that makes me look and feel cheerful. To recap what you've already read here and here, Rouge d'Armani Sheer Lipstick features a fabulous creamy texture, feather light and translucent, as hydrating as a balm. The brilliant bold color is wearable and chic. Don't be mislead by how the colors look in the tube - try them. Or just order most or all of them, as I did. A cutting-edge color formulation process, the Color Shine Moisture Polymer, a revolutionary component, is able to retain twice its volume of water and enhance color luminosity while locking in hydration on the lip surface for over eight hours. Three shades hover between straight orange and pink-orange: Acid Tangerine 300, Mandarin Orange 301, and Orange Mutation 302. Three incandescent reds, sheer versions of Rouge d’Armani 400 are available: Red Carpet 400, Ripe 401, and Scarlato 402. Three lively transparent pinks will make you pink lovers delirious: Ecstasy 500, Vita 501, and Blush 502. I don't know why the Armani Beauty Web site only shows two pinks. So far, I've been unable to get a response from PR. Three purple shades, Bitten 600, Tulipe Noire 601, and Black Lacquer 602, are divine. If you like sheer lip color, you won't want to miss out on Rouge d'Armani Sheers. Fortunately, as far as I know, these new lipsticks are not limited editions. You can take your time selecting one or more. They were introduced to replace Armani's original Sheer Lipstick, which is still available in five shades, but I expect will disappear with sell-through. You can find the Rouge d'Armani Sheer Lipsticks at Armani Beauty's Web site and Armani Beauty counters. I'm still waiting for that call from Saks. Think it will ever come?